The XPR-15CL two-post car lift offers 6,804 kg. of lifting power. Not only does this lift let you operate on low-profile cars, it has the ability to lift some extremely heavy trucks and vans. 6,804 kg. is enough to lift a dump truck, so you’re covered on most lifting applications. With lift columns placed farther apart to accommodate wide truck mirrors, even full-size pickups are a cinch to lift. If this is the last lift you ever purchase, you’re going to have it with you for a long, long time. With a BendPak car lift, expect incredibly fast rise and descent speeds, as well as the ability to open doors without banging them against the lift columns. The XPR-15CL comes with the same safety features as our other XPR series lifts. Easy-to-use, friendly interfaces come with the best customer service and installation teams in the business. From the breezy ordering process to delivery and installation, BendPak makes getting a powerful lift that fits in your garage a hassle-free experience. Designed to allow users the freedom to move freely underneath the lift, this model features our Clearfloor design. The hydraulic lines run overhead, safely tucked inside the top crossbeam. By utilizing two low-pressure HVLP direct-drive cylinders, we've eliminated the need for lifting chains or screw mechanisms commonly found on other lift designs. HVLP direct-drive technology offers better reliability, smoother operation and less maintenance. High-volume and low-pressure equates to less workload placed on the entire hydraulic system. BendPak hydraulic cylinders are made from pilot-fitted, machined steel pistons wrapped with specially designed, pressure-loaded U-cup piston seals, backups and wear bands that do not allow fluid to bypass back across the tubing. The rod is composed of C-1045/50 micro-alloy steel and plated to a minimum of .001" diametrically. Our high-durometer, mechanically loaded rod seals prevent rods from leaking, and a urethane rod wiper provides exclusion protection. The cylinder body is welded from high-grade steel and meets/exceeds ASTM specifications. If you’re looking at the XPR-15CL, we know you might be servicing some extremely heavy equipment: garbage trucks, large fleet vans, small buses and more. The telescoping arms on this two-post lift have you covered to safely lift up to 6,804 kg. Sports cars and low-profile compact vehicles are no problem for the XPR-15CL. If we raised the lift capacity but lost the ability to service more commonly used vehicles, we’d really be doing ourselves (and you) a disservice. 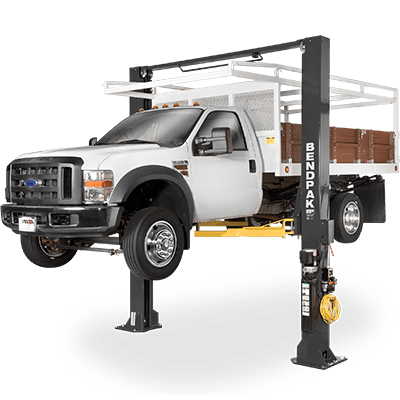 BendPak’s heavy-duty lifts expand your lifting potential; we don’t simply swap light-duty capability for heavy-duty capability as you move up the chain. Every two-post ​lift comes standard with our 16-piece adapter set, so you never have to worry about lift points that are too high or too low. You’ll get eight stackable adapters, four ​76 mm and four 152 mm, as well as eight cradle pads (four polyurethane pads and four cradle pads). If you’re lifting trucks or vans with running boards or auxiliary fuel tanks, the adapter set is must-have, and it comes at no extra cost to you! Because the dimensions on the XPR-15CL are expanded to accommodate larger-type vehicles, BendPak designed the arm tube supports low enough to accommodate small vehicles. There’s no point in having a workhorse that handles heavy stuff but not lighter stuff, so we’ve made sure each type handles the same vehicles as our lighter-capacity lifts. Heavy vehicles present an increased need for safety features. The thought of a full-size pickup or garbage truck falling on your garage floor is truly frightening. BendPak eliminates the risk by including extremely powerful auto-locking arm restraints that engage when the lift goes up and release when it descends. By building our lifting carriages ​1,346 mm high, BendPak two-post lifts are made safer, more durable and more efficient than our competition’s carriages. Durable, reliable and totally chemical-resistant, BendPak’s UHMW (ultra-high molecular weight polyethylene) load bearings last forever. No lubrication or maintenance necessary. Two XPR-15CL columns can hold a combined weight of 6,804 kg. This is possible in part because of their single-piece construction, which reduces and evenly distributes the stress across the columns. Need to stop all procedures immediately? A single-point safety release is in place for you to use at a moment’s notice. A dual-synchro equalization system ensures your two-post ​lift rises equally no matter what. If any vehicle touches the overhead structure, the ​lift automatically shuts off, even if the user continues to attempt to raise the ​lift. With ​10 mm hydraulic lines, a high-flow pump and integrated AC power-unit, this car lift is one of the fastest in the industry. The safe and rugged XPR-15CL-192 features lift columns that are longer than the standard model, so larger vehicles can be easily accommodated.